The placenta is an organ a?ached to the lining of your womb during pregnancy. The placenta keeps your unborn baby’s blood supply separate from your own blood supply, as well as providing a link between the two. The link allows the placenta to carry out func?ons that your unborn baby can’t perform for itself. The placenta is connected to your baby by the umbilical cord. Your baby is inside a bag of fluid called the amnio?c sac, which is made of membranes. The placenta produces hormones that help your baby grow and develop. The placenta also gives some protec?on against infec?on for your baby while it’s in the womb, protec?ng it against most bacteria. However, it doesn’t protect your baby against viruses. Towards the end of your pregnancy, the placenta passes an?bodies from you to your baby, giving them immunity for about three months a?er birth. What does the placenta contain? CORTISONE;:Combats stress and unlocks energy stores. Promotes healing and reduces inflamma?on and swelling. CORTICOTROPIN (CHR): Increasing your CRH will help prevent POST NATAL depression a?er birth. GAMMAGLOBULIN: Immune booster that helps protect against postpartum infec?ons. GONADOTROPIN: The precursor to oestrogen, progesterone and testosterone. HEMOGLOBIN: Replenishes iron deficiency and anaemia, a common postpartum condi?on. HUMAN PLACENTAL LACTOGEN (HPL): S?mulates mammary gland func?on and milk produc?on and regulates maternal glucose, protein, and fat levels. IMMUNOGLOBULIN: An?bodies that help the immune system. IRON: Increases energy and decreases fa?gue and depression. Restocks maternal iron stores to combat anaemia. INTERFERON: S?mulates the immune system to protect and fight against infec?ons. OXYTOCIN: For pain and bonding; produced during breas?eeding to facilitate bonding of mother and infant. Enhances the breas?eeding let-down reflex, in reducing post-partum bleeding. OESTROGEN, PROGESTERONE AND TESTOSTERONE: Help developing mammary glands in prepara?on for lacta?on and stabilises post-birth uterine cramping. PLACENTAL OPIOID-ENHANCING FACTOR (POEF): S?mulates the produc?on of your body’s natural opioids, including endorphins, reduces pain, increases well-being. PROLACTIN: Promotes and increases lacta?on. THYROID STIMULATING HORMONE: Regulates the thyroid gland, Increases energy and helps with recovery from a?er birth and stressful events. UROKINASE INHIBITING FACTOR AND FACTOR XIII Stops bleeding and enhances wound healing. What are the benefits of having your placenta made into pills? Dried placenta powder was recognised as a potent medicine in Europe for centuries and used to treat and cure many ailments, mostly those surrounding birth. However since the late 19th century most natural birth methods were replaced by modern birthing techniques, losing along the way many valuable tradi?ons prac?ced for centuries. The benefits of consuming the placenta are being rediscovered and scien?sts are beginning to study placentophagy in humans. Tes?monials from many new mothers reveal that consuming the placenta a?er birth helped improve energy levels, increased milk produc?on and slowed or stopped post-birth haemorrhaging, crea?ng an overall healthier and quicker post-birth recovery. MILK PRODUCTION: Placentas contain prolac?n-like hormones at birth, so are thought to be a lactogen. They have small amounts of oxytocin, which not only eases birth stress, but also causes the smooth muscles around the mammary cells to contract and eject milk. In fact, in 1954 researchers conducted a study on 210 women with insufficient milk supply. These women were given dried placenta to consume, and in just a ma?er of days, 86% of them had a posi?ve increase in milk supply. (Placenta as a Lactagogon; Gynaeco- logia 138: 617-627, 1954). ANALGESIA EFFECTS: Since the placenta s?ll contains opium-like substances from childbirth, it may reduce the level of pain a mother feels postpartum. The amount of blood, vitamins, minerals, and protein in the placenta may be of great benefit to the mother consuming it, as it will give her more energy and replenishment. This can be par?cularly helpful to vegetarian mothers. ENERGY LEVELS: Cor?sone contained in placenta combats stress and unlocks energy stores. Promotes healing and reduces inflamma?on and swelling. Placenta also contains Thyroid S?mula?ng Hormone (TSH), which regulates the thyroid gland, it increases energy and helps with recovery from a?er birth and stressful events. RECOVER FROM BLOOD LOSS: High levels of prostaglandins exist in the placenta, which s?mulates involu?on (the shrinking of the uterus to its former size). This may help reduce or stop postpartum bleeding (also reducing anaemia), and cleans out the uterus. The oxytocin in the placenta may also be a factor in reducing or stopping bleeding. IRON SUPPLEMENTATION: During and a?er a normal vaginal delivery (including post-natal bleeding) a new mother will lose between 1/8 to 1/10 of her body’s blood supply. With caesarean sec?on births, blood loss can be significantly more. Losing a large amount of iron so quickly can cause anaemia, leaving a new mum feeling ?red, faint and exhausted. The blood needs high supplies of iron to carry oxygen to the cells. Low supplies of oxygen leave your cells starving and less able to heal a?er trauma. The placenta benefits the new mother by supplying incredibly rich meaty iron, amino acids and essen?al fats which is believed to be the perfect replenishment following birth. 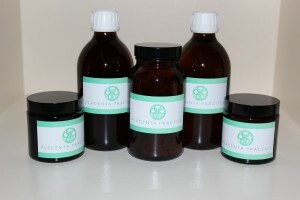 What remedies can be made from the placenta? However the most modern non-invasive way to consume the placenta is in capsule form, known as Placenta Encapsula?on. Preparing the placenta into easy-to-take placenta pills is a simple way to ensure postnatal health and vitality of the mother a?er the birth of the baby. 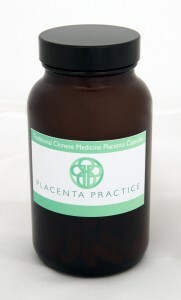 The placenta is unique and the perfect nourishment for healing and rejuvena?on a?er birth. The placenta contains one of the highest concentra?ons of essen?al hormones, iron, B vitamins and micro-nutrients found in any plant or animal species.